I’d heard of this place a few years back and instantly wanted to go, placing Inishmor on the very top of my must visit places. Gaz Parry and Ricky Bell had been busy and the pictures and stories were enough to make me want to book a trip straight off. But things got in the way, particularly a redpoint siege at Malham, not to mention life stuff in general. But at last an opportunity. Ricky Bell would be there for all of May and this was a chance to climb with the undisputed Godfather of Irish climbing. So we committed to going; Myself, along with Miles Gibson and Ben Heason would join him. The plan was to find some world class traditional routes. This is something I’ve been after for years; new ones are not easy to find close to home! This is maybe the one area of climbing I never got to push; a dabble here and there, but never really getting stuck in. Surprisingly England and Wales are getting close to being climbed out. There are some lines left to go, but not many at all. Very few that fit my requirements: awesome line, hard, and enough protection to make it not death! 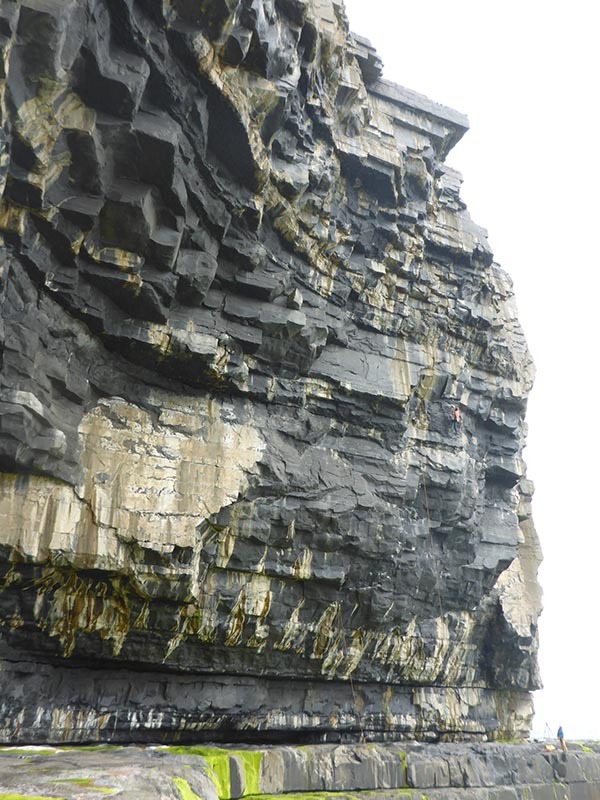 Inishmor looked like a massive Pembroke, which is surely the best place in the UK for trad climbing. There just had to be an almost endless supply to go at. I scoured the guide, [excellent guide with all info – link at bottom] showing a scattering of trad routes, about 100 or so, clustered curiously in short areas, and then hugely spaced out: a route or two, then a few hundred meters, another route, then a kilometer with nothing. But towering lines were everywhere on the photo topo! Crispin Waddy had been a few times in the 80’s, and plenty of others had followed. The question had to be asked; Why so few routes? Gaz and Ricky had been developing sport routes in the big overhanging caves, with mutterings of there being no gear. But I just brushed that off, of course there would be gear, it was just a matter of looking. Marmot and The BMC wanted to be there to capture the trip, which had all the potential of being amazing, other than the potential of being a total wash out. This is after all The West Coast of Ireland; battered by The Atlantic and first in line for every storm. And so with Ben Pritchard and a bag full of film cameras we made our way out. Inishmor is part of The Aran Islands, there being three in total, with Inishmor the largest and in fact the name translated means ‘Big Island’. All are incredibly beautiful and have been more than discovered by tourists, making getting there very easy, though fortunately for us climbers, all the tourists don’t want to go anywhere near where we want to be. We left Sheffield at 9.30am, and were drinking a beer on the island by 7pm. There is great camping, 10 euro a night, but we opted for a hostel for 20, which was luxury enough for us, and actually not really more expensive considering the extra bag we’d have needed to bring all the camping gear. First day: scorching! Blue sky from horizon to horizon. At just 80m high at its peak, the island is really flat, and the drystone wall covered landscape stretches off into the distance to abruptly drop into the sea giving amazing 360 degree views. We began at ‘The Cave’, 40 minute walk or 10 minute drive from the tiny port village of Kilronan. Ricky was super excited to show us ‘the future of hard climbing’. And he was not exaggerating. We clambered down the old fishermans route then spent a few hours walking along the huge ledges staring upwards, stumbling backover at the scale and steepness of the walls. I’ve never in my life seen so much potential, not anywhere in the world. In just a fraction of the cliff we saw potential for hundreds and hundreds of routes, and for the hard stuff…. Well, you want 9b’s and above? This is it! But immediately the facts clicked: no routes in the guide, talk of no gear, recent bolting…. Basically, there is no gear! Hence the lack of previous development. I have not seen anything like it. Limestone but like granite, but granite with no cracks, save the standard horizontals at maybe 5 meters and 25 meters for your cam size 5! Features abound, edges, corners, aretes, bulges. But just no gear. In about 500m we noted maybe 4 or 5 ‘possible routes’, which turned out to be the ones in the guide. So, sport climbing it had to be, and we got stuck in to the efforts of Ricky, Pete Robbins and others on the 15 or so bolted lines. Miles and Ben were on three star 7’s and I managed a flash of an 8b, and a first ascent of another 8b after a quick abseil inspection while Ricky got closer to his 8c project. The most obvious feature is the rock quality; absolutely bombproof, as solid as it can be. Totally fused and compact. Routes are steep and bouldery and technical; like granite bouldering, but have an adventurous feel in wild positions with the sea crashing below. It kind of feels too good to be true, like embarking on some insane trad route in Pembroke, and yet you are safe with bolts and none of the worry about topping out on a pile of tottering blocks. But I’d been caught, and I checked again. This time looking more closely at the first 5 meters that so far remained unclimable with a running wet streak. Would it dry? I prepped the rest of the line, chalked it, made sure. Then monitored the wet as the sun baked the face. Surely it would dry. But it didn’t. Not even close. And so I was saved really from my own ego as the decision was made for me. Disappointed, as the day escaped us I hurriedly abbed down the very arête of the wall to investigate a single good cam spot I seen on my pendulum travels across the face. A consolation route, though as fine as any I’ve done in many years. 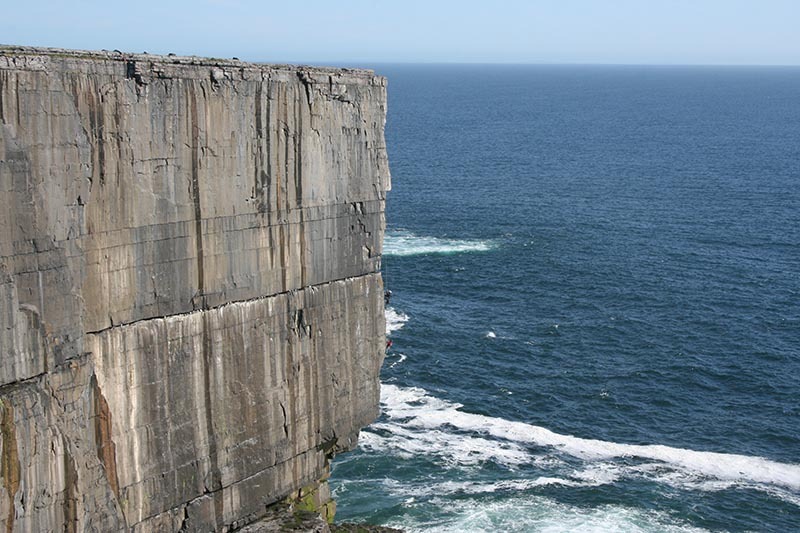 It starts on a perfect ledge above just above the crashing sea (large cam belay) to climb to the miraculous gear placement that protect hard moves out to the arête, then in true Inishmor style follows the arête, fortunately easing, with absolutely no gear whatsoever into a complete solo mission to the half height ledge. Above the ledge it’s more normal, even more gear, a rarity to be savored. E5. Staring back from our ferry at the streak of white limestone on the horizon as we sailed towards the mainland I was still in a confused state. I’d come for trad and I’d found some. But had I? It was what I was looking for despite what is on offer. I’d forced some. This place appears to be a trad heaven, but it’s not. It just looks like places I’ve been to with great trad climbing. 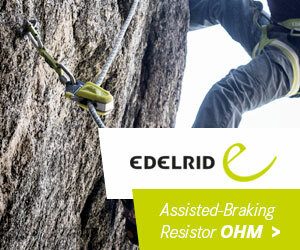 There will be some incredible trad routes, but overall the rock lends itself to sport. Like Portland, or Malham cove, or Kilnsey. But the future is bright, developers are like us, preserving potential trad where it makes sense, and equipping sport routes on the vast unprotectable faces. Both styles will exist side by side quite happily. It’s just starting out really. But watch this space, Inishmor will be a destination on the map very soon. So far there are about 15 sport routes all equipped with quality stainless bolts (paid for out of the pocket of the developers). There will most likely be a rapid rate of development soon to come. Travel - Fly to Shannon or Dublin. Many cheap flights. 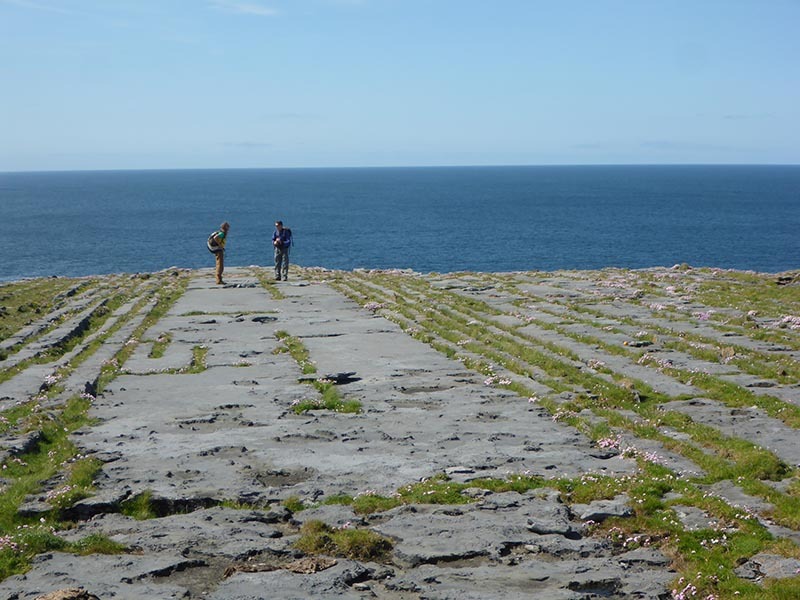 Take a ferry from Rhos A Mhil or Doolin to Inishmor. Ferry takes 45-60 mins and costs 30 euro return for a foot passenger. Taking a car is much more expensive. You don’t need one on the island. There are some buses, and bike hire is easily available, though if you are staying for a month you may want your car. Accomodation - Camp in the very smart campsite, or stay at the Kilronan Hostel or the many hotels. Food available from a surprisingly good Spar, though a tad expensive as you’d expect. Maybe take some supplies if you are stingy like me. Gear - A 60m abseil rope is useful for sure. Take rope protectors. 80m single sport rope useful, the routes are long. Take the odd lower-off screwgate as some of the belays are missing these – as the equippers have limited funds (they are paying for all the hardwear themselves – big thanks to them!). Full trad rack required, including large cams, and tons of tiny brass wires. This article originally appeared on Steve's blog.